Doing his job, minding his own business, driving people around as is required of a taxi-driver, Tom Matthews was recently clocked going a little over the speed limit. Just how much is “a little over the speed limit” anyway? 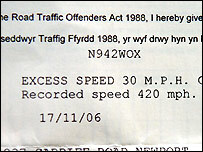 But when notice of a Ã‚Â£60 fine and three penalty points arrived, the recorded speed was 420mph – in a 30mph zone. Dad of one Tom will fight the penalty notice. I think he’s got a real chance to win this one on appeal.